→ Quality is a degree of excellence. 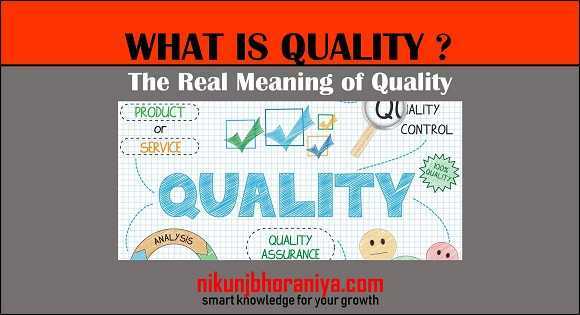 → Quality is a Conformance to specification. → Fit for Purposes - A product or process is fit for purpose. → Conformance to Requirements - A product or process is conformance to requirements. → Meeting the requirements of the customers. 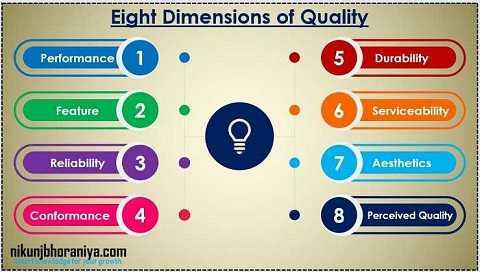 → It is not only saying the product, process or service is ok or not ok but also it has eight different dimensions which are given below. → Performance is the product will perform as expected by the user and as specified by the manufacturer. → If products do not do as buyers expect, users will be disappointed and frustrated. → Poor performing products get negative reviews and lose sales and reputation. → The performance of a product reflects on the profitability or reputation of the business. → What additional benefits will be added to the product? → Some features will be present in all products. → Is the product consistent? → Will it perform well over its expected lifetime and perform consistently? → Usually, reliability may be closely related to the product's performance. → Many brands have developed trust with customers because of their product’s reliability. → e.g. Apple, Microsoft, Google…..
→ So the reliability of the product is a major contributor to any brand or organization. → Does your product meet the specification which was given by the customer or mentioned in design? → Durability is related to how long will the product perform and under what conditions? → usually, the durability of the product is closely related to the warranty. → Sometimes, the product's durability is mentioned in procurement contracts and specifications. → How durable is your product? → Will it last long with daily use? → Serviceability is the ability of the product that is easy to maintain and repair. → Make sure customers are satisfied with the products and services of the organization. → Aesthetics is the look of the product in simple language. → The aesthetic dimension of a product is playing a major role in an organization or brand's identity buildup. → Perception is a reality or how the customer thinks about a specific product is called perceived quality. → What brand name is going to be used and does this convey any perception? Thank you brother for sharing this information with us. Really appreciate your efforts Mr. Nikunj.